Mystery rock. This was brought in by an archaeologist. Lineaments are due to weathering, plow-scratches, and glacial scrapes. external consultants for evaluating the validity of the results. Robert M. Thorson – Professor of Geology, Department of Ecology & Evolutionary Biology and Department of Anthropology, College of Liberal Arts and Sciences, University of Connecticut. (Principal Investigator). 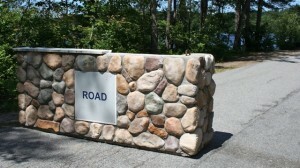 Professor Thorson coordinates the Stone Wall Initiative. David M. Moss – Associate Professor, Neag School of Education, University of Connecticut (Co-Principal Investigator). His current research interests are in tandards-based science education reform and teacher education. Wendy J. Glenn – Associate Professor of English Education, Neag School of Education, University of Connecticut (Co-Principal Investigator). Her current research interests are in the areas of integrated curriculum, childrens literature, young adult literature, and teacher preparation. 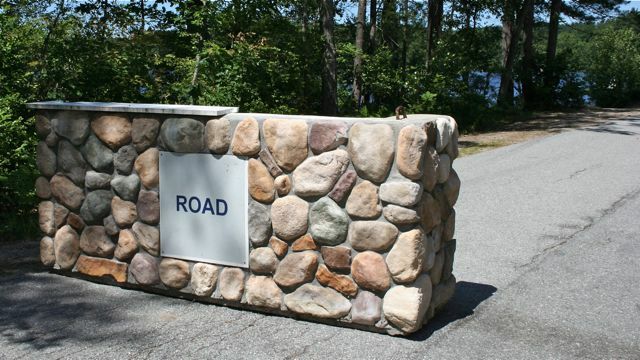 A fake rock barrier. “Boulders” are a textured surface made of cement dyed to different colors. They weigh almost nothing. Dana Gnesdilow, Ph.D., Science and Reading Teacher, Mansfield Middle School, Mansfield, Connecticut. Thomas Swale, M.Ed. – Co-author of lesson plans. Currently a teacher in the West Hartford School System. Elizabeth Reemsnyder, M.Ed – Co-author of lesson plans. Recent graduate (May, 2005) not yet places in a school. 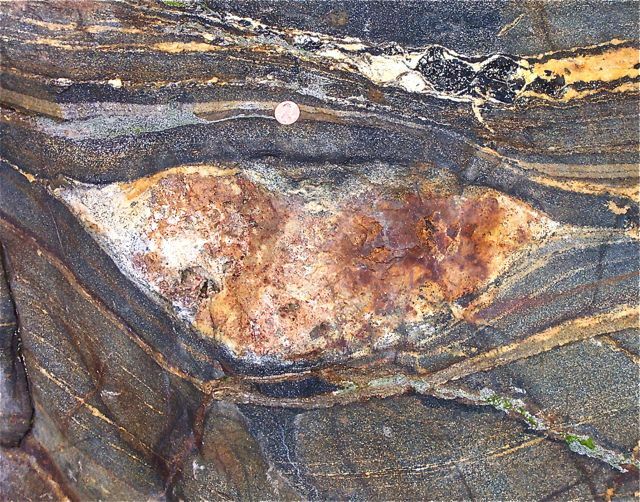 Paul Bierman, Ph.D., Department of Geology, University of Vermont. Colleagaue external to the project, principally responsible for evaluating the validity of the science. Douglass Kauffman, Ph.D. Department of Curriculum and Instruction, University of Connecticut. Colleague external to the project, principally responsible for evaluating the validity of the pedagogy. Neil Christianson — Education Director, Old Sturbridge Village, Sturbridge MA. Richard Weyel – 3rd Grade Teacher, Goodwin Elementary School, Mansfield CT.
Shirley Reilly – 3rd Grade Teacher, Goodwin Elementary School, Mansfield, CT.
An eye into the world. 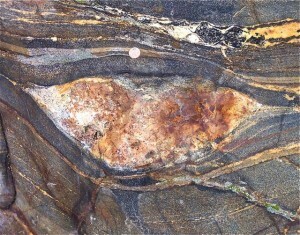 An “augen” (German for eye) of quartz in a gneiss in Mansfield, CT.